Last month the prominent immigration researcher George Borjas posted a challenge to a seminal study in my review. 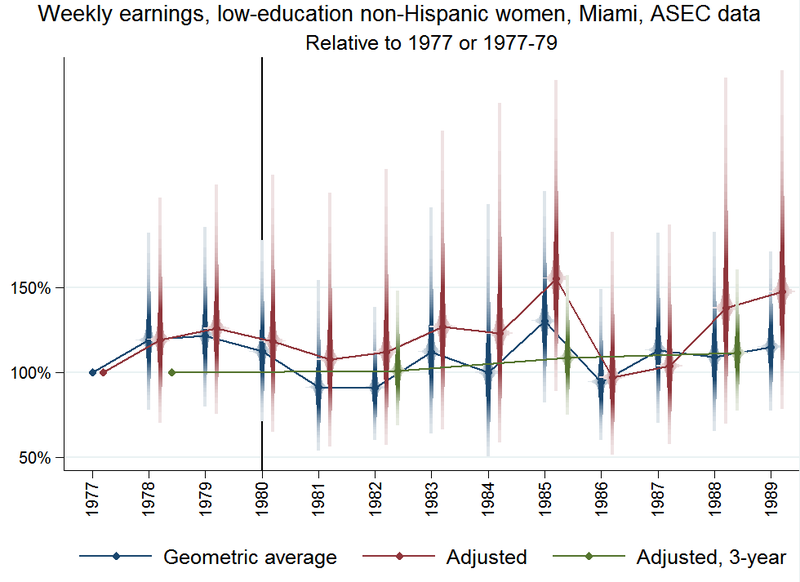 His new paper contends that the Mariel boatlift, which brought some 60,000 Cuban refugees to Miami in 1980, did profoundly affect the labor market there, depressing wages for low-education men (ones with less than a high school education) by 10-30%. Borjas's work is especially significant because it seems to upend a study of the boatlift published by David Card 25 years ago, which found little impact of all that immigration on workers in Miami. Interestingly, Borjas, who emphasizes the harm of Cuban immigration, is himself a Cuban emigré. I see no sharp breaks from long-term trends of the sort that could be confidently attributed to the 1980 immigration surge. 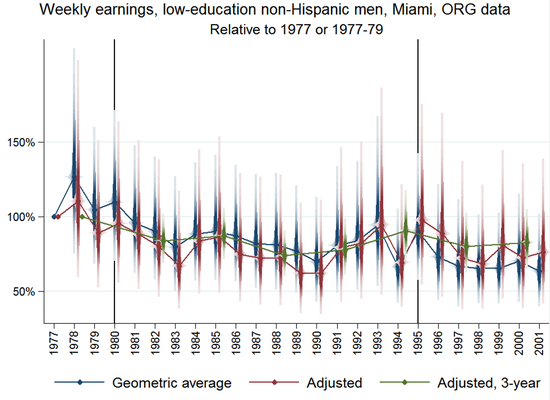 The Borjas analysis appears correct that wages for low-education Miami men (defined henceforth as those with less than a high school education) were lower on average in 1981-83 than in 1977-79 – with the drop being larger than in most other US cities. But the data argue more for a steady long-term decline than sudden drops after immigration surges. The Borjas analysis tends to obscure this distinction by aggregating or smoothing data over several years. The original study by David Card is one of 17 covered in my review, including three others exploiting natural experiments in mass migration. None of the studies is as compelling as a randomized trial, but the overall picture – of at most modest harm from substantial immigration – does not change if the Card study is removed. In addition, as Borjas documents, a second wave of Cuban immigration, about half as large, arrived in 1994-95 (Borjas, Figure 1). My data and code replicate the Card numbers quite well – some perfectly, the rest close enough to still support Card's inferences. Borjas's retort a quarter century later draws on the same underlying data. But it differs in many respects. It limits the sample to ages 25-59 instead of 16-61, excludes women and Hispanics, favors different cities for the control group, focuses more on low-education workers, and differs in other minor ways. At first, I found the Borjas conclusion quite striking: in this extreme case of immigrant influx, it seemed that vulnerable people – those with little education – actually had suffered, and that this had been overlooked in Card's analysis. But as I probed more, I became less convinced. To explain my thinking, I'll touch on some key differences between the two studies, then show you some graphs of annual data. To my knowledge, the US Census Bureau conducts two surveys that gather national information on people's work and earnings. Both are part of the Current Population Survey (CPS) family, which originated in efforts during the Great Depression to get a firmer fix on how many people were employed and how much they were making. According to this FAQ page, the CPS interviews 50-60,000 households every month. Once a household enters the survey sample, it is interviewed once a month for four months, then left alone for eight months, then interviewed again, in the same four calendar months as before. The last of each quartet of interviews includes questions about how much household members worked and earned in the previous week. Since this information comes from people on their way out of a survey cycle, it is referred to as "Outgoing Rotation Group" data. ORG data undergird the government's monthly announcements of job growth and unemployment rates. Because of the larger samples, analysis based on the ORG data seems more reliable. In addition, the ORG survey records recollections of earnings last week rather than last year, which may be more accurate; on the other hand, weekly data can be noisier since some people's earnings vary substantially week-to-week. Notably, the more dramatic results in the Borjas paper come from the smaller ASEC samples. I am not sure what this means. 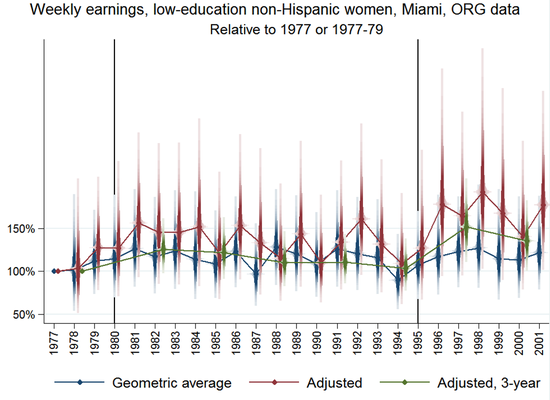 The idea seems to be that forces unrelated to the Cuban influx were driving trends in women's earnings, and these could mask the effect of that influx. [Update, October 21: an email from Borjas appears to confirm this reading.] But similar things might be said for low-education men, whose earnings would have been influenced by broad events such as recessions and de-industrialization. Analytical devices such benchmarking against control groups and focussing on changes immediately after the immigration influx should seemingly work as well for women as for men. So it seems to me that Borjas's methods will work as well or poorly for both genders, and that both merit attention. A third differences is that while Card reports annual figures, Borjas groups data into longer periods, in various ways. His graphs show three-year moving averages. 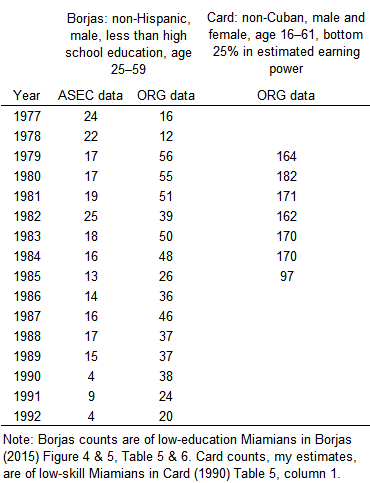 Some regressions (Borjas, Tables 5 & 6) compare 1977-79 to 1981-83 and subsequent three-year periods. Others combine 1981-86 into a single "short-run" post-boatlift period. Put otherwise, Borjas appears readier than Card (or me) to attribute changes 3-5 years after the boatlift to the boatlift. I am unready because many forces buffeted the Miami economy circa 1980 – an oil shock, extreme interest rates, two recessions, and a debt crisis in Latin America. To be fair, they affected cities in the control group too, but perhaps not equally. A relative wage drop 3-5 years after the boatlift seems to admit many explanations. To pierce the confusion, I made some graphs. They are designed to closely parallel Borjas's statistical analysis – the samples, the control group, the control variables, the formulas for variables such as earnings – while breaking out the data by year. In red, in the same graph, are average wages after adjusting for the evolving the age composition of the group and systematic differences in earnings growth or decline across cities, as well as benchmarking against a Borjas-favored comparison group (Anaheim, Rochester, Nassau-­Suffolk, and San Jose). All of these adjustments mimic the Borjas analysis. The cities in the Borjas comparison group look peculiar as a collective benchmark for Miami, but were chosen because they most nearly matched Miami's 1977-80 employment growth rate of 15.3% (Borjas, Table 3). At any rate, these adjustments make little difference. The red diamonds – shifted right of the blue ones for legibility – also show a wage decline from the late 1970s to the early 1980s, with an especially big drop in 1982. Last, the green diamonds show the result of grouping data into three year-periods, again in order to copy Borjas (Borjas, Table 5 & 6). Comparing green dots, wages were clearly lower in 1981-83 than in 1977-79. 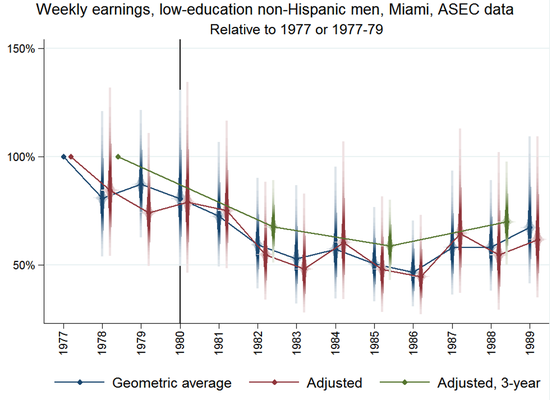 Borjas too makes graphs from ASEC data; they show earnings for low-education men in Miami nosediving in the 1980s. I see two problems with those graphs. First, as I mentioned, they plot three-year moving averages, which obscure the timing of the declines in a context where timing is of the essence. Second, unlike the graph above, Brojas's graphs include no confidence intervals, so they convey false certainty to the untrained eye. The decline circa 1980 is still visible. But it looks a bit milder now. The trough in 1983 no longer approaches the 50%-drop line. And this flattening parallels Borjas's statistical results, which are milder for ORG data (Borjas, Table 5, row 1, vs. Table 6, row 1). 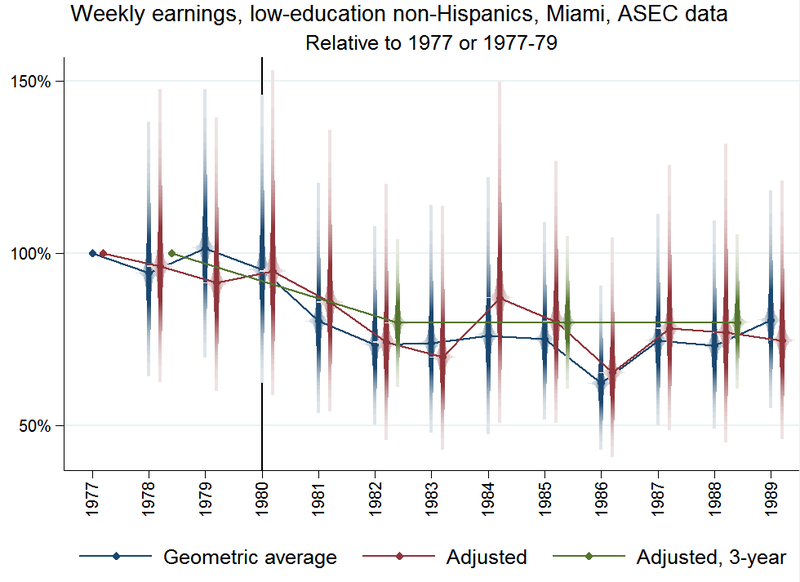 Nevertheless, Borjas's finding of a wage decline after the 1980 boatlift still looks reasonable, if read literally. Notice that in 1977-82, the blue diamonds for average wages are statistically indistinguishable, as are the red ones for the adjusted means. It is only in 1983 that a larger drop emerges, and even it is transient, indistinguishable from noise. Meanwhile, wages rise, if anything, after the 1994-95 immigration surge. All this graphical analysis is a bit loose, but the graphs come from formal regressions, numerical results from which are in two tables. 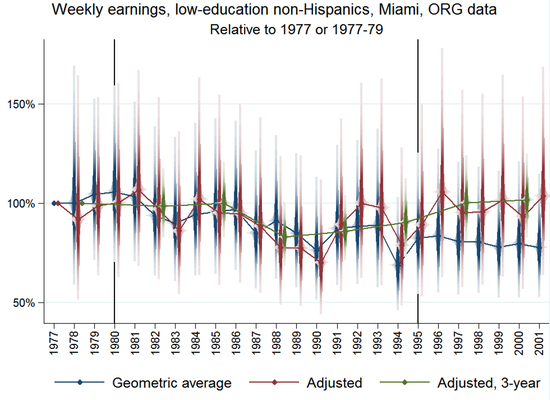 These check whether annual and hourly wages and, in the ORG data, employment and unemployment changed significantly in Miami from 1980 to 1981, 1982, or 1983, as well as from 1977-79 to 1981-83. They show changes with little significance by 1981 but more significance by 1982. Possibly the Mariel boatlift did swamp the Miami labor market, but with a two year delay. But these results are also consistent with the continuation of long-term trends in Miami. I see no strong basis for implicating immigration. In its favor, Borjas's work has accentuated my appreciation of the limitations of Card's study. Even when looking short-term, over a year or so after a major immigration flow, many factors many disturb labor markets enough to obscure the effects of immigration. There is a lot of noise in the data. The appearance of no real effect is not conclusive. But my previous, terse summary still reads about right to me: "Natural experiment not as perfect as randomized since other events could have offset Boatlift’s effects. But zero change after 7% labor supply spike most easily explained as (non-)impact." More broadly, the overall impact of immigration on workers in the receiving country looks modestly negative at worst, with the most vulnerable group being recent immigrants. And there is little doubt that migrants from poor countries as a group gain immensely by migrating. 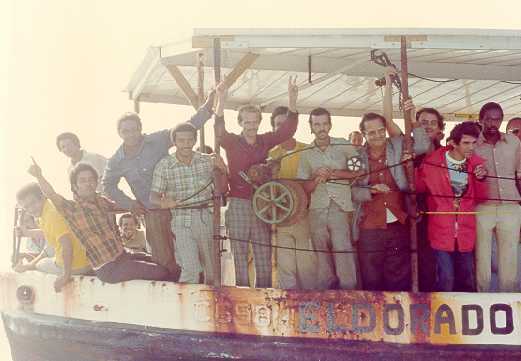 Thus, as Borjas points out, "The Mariel Boatlift That Did Not Happen" actually did happen. For clarification of that cryptic statement, see my discussion of Card (1990). Unemployment is the fraction of those in the labor force – defined as those who have or want work – who are not working. Employment is the fraction of working-age adults who are working. Results come from a regression of log inflation-adjusted annual earnings, expressed per week worked, on year dummies. Results are exponentiated for presentation, producing geometric averages. Copying Borjas, the sample is male, non-hispanic workers aged 25-59; "top-coded" earnings are multiplied by 1.5; those with hourly wages below $1.50 or above $40 in 1980 dollars are excluded; Census Bureau-supplied weights are incorporated; and standard errors are heteroskedasticity-robust. The dependent variable is the log of last week's earnings. Following Borjas, the sample is male, non-hispanic workers aged 25--59; "top-coded" earnings are multiplied by 1.5; and those with hourly wages below $1.50 or above $40 in 1980 dollars are excluded.